Image description: Rectangular graphic with yellow background and black text and icons. 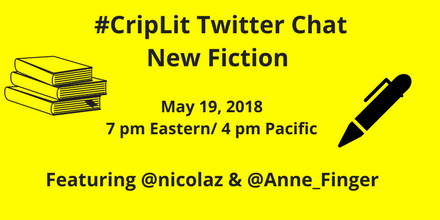 Text reads, “#CripLit Twitter Chat, New Fiction, May 19, 2018, 7 pm Eastern/4pm Pacific, Featuring @nicolaz & @Anne_Finger.” The text is flanked on the left with an icon of a pile of books, and, on the right, a pen. You are invited to the eleventh #CripLit chat co-hosted by novelist Nicola Griffith and Alice Wong of the Disability Visibility Project®. For this Twitter chat we are delighted to be joined by Anne Finger. Nicola and Anne will talk about their new novels—both published on Tuesday, May 15—which feature disabled protagonists. They will answer the guideline questions below, but may also ask each other questions, too. What we really hope is that you will ask Anne and Nicola plenty of questions, and add your own answers to some of the questions here. We want a good conversation about excellent fiction featuring disabled characters! Anne Finger is an activist, educator, and writer who has long been prominent in the U.S. disability movement. The author of four volumes of fiction and two memoirs, she has served as president of the Society for Disability Studies, the president of Axis Dance Company, and written for Disability Studies Quarterly. Nicola Griffith is a native of Yorkshire, England, where she earned her beer money teaching women’s self-defense, fronting a band, and arm-wrestling in bars, before discovering writing and moving to the US. After her 1993 diagnosis of multiple sclerosis she focused on writing. Her novels are Ammonite, Slow River, The Blue Place, Stay, Always, Hild, and her new one, So Lucky (FSG Originals, 2018). She is the co-editor of the BENDING THE LANDSCAPE series of original queer fiction. Her essays and short fiction have appeared in a variety of journals, including Nature, New Scientist, Los Angeles Review of Books, LitHub, and Out. Her work has won, among others, the Washington State Book Award, the Tiptree, Nebula, and World Fantasy Awards, the Premio Italia, and Lambda Literary Award (six times), and is translated into 13 languages. She has served as a Trustee of the Multiple Sclerosis Association and the Lambda Literary Foundation, is a contributing editor of the Los Angeles Review of Books, and a member of the Advisory Board for the Journal of Historical Fictions, and the SF Gateway. She is now a dual US/UK citizen, holds a PhD from Anglia Ruskin University, and lives in Seattle with her wife, the writer Kelley Eskridge. Book Review: A Woman, in Bed, Kirkus, Jan 3, 2018. Book Review: A Woman in Bed, by Michael Northern, Wordgathering, March 2018. I Built My Own Godd*mn Castle, by Elsa Sjunneson-Henry, Tor.com, July 31, 2017. Welcome to the #CripLit chat on New Fiction with Disabled Protagonists. This chat is co-hosted by @nicolaz & @disvisibility with guest host @Anne_Finger. Please remember to use the #CripLit hashtag when you tweet. Q6 Why do you think so few novels pass the Fries Test? Do you think it’s harder to write and/or publish #CripLit fiction or nonfiction? Q7 Do you see parallels between #CripLit narratives and those of other marginalised groups: queer, POC, working class, etc? Q8 Do you have any advice for writers wanting to tell #CripLit stories? Q9 Where should we look to discover new #CripLit fiction? How can we help each other write and publish more?